Highwaters Media was featured in an article by Amanda Baltazar titled ‘The Anywhere Office’. 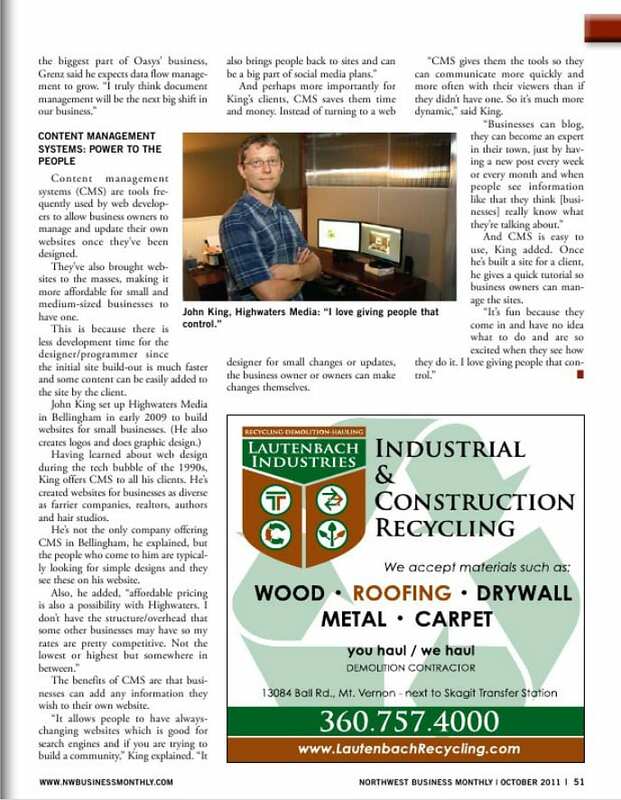 This article was published in the October 2011 issue of Northwest Business Monthly. Content management systems (CMS) are tools frequently used by web developers to allow business owners to manage and update their own websites once they’ve been designed. They’ve also brought websites to the masses, making it more affordable for small and medium-sized businesses to have one. This is because there is less development time for the designer/programmer since the initial site build-out is much faster and some content can be easily added to the site by the client. John King set up Highwaters Media in Bellingham in early 2009 to build websites for small businesses. (He also creates logos and does graphic design). Having learned about web design during the tech bubble of the 1990s, King offers CMS to all his clients. He’s created website for businesses as diverse as farrier companies, realtors, authors and hair studios. He’s not the only company offering CMS in Bellingham, he explained but the people who come to him are typically looking for simple designs and they see these on his website. The benefits of CMS are that businesses can add any information they wish to their own website. And perhaps more importantly for King’s clients, CMS saves them time and money. Instead of turning to a web designer for small changes and updates, the business owner or owners can make changes themselves. CMS gives them the tools so they can communicate more quickly and more often with their viewers than if they didn’t have one. So it’s much more dynamic,” said King. And CMS is easy to use, King added. Once he’s built a site for a client, he gives a quick tutorial so business owners can manage their sites.